It could be argued a good beer goes well with just about anything. After a hot summer day on a demolition job, though, a light beer with lime will probably taste more refreshing than a heavy stout. Finding that perfect malt after a long day feels great, and finding a perfect-fitting demolition attachment will get that beer served up a lot sooner. With hundreds of sizes and styles of demolition attachments on the market — from small grapples to massive pulverizers — it's not as easy as picking one, attaching it to an excavator and expecting top production. Like a good beer, some tools just fit better at different times. Knock out jobs faster by refining the demolition attachment selection process. Consider the application, the carrier, the return on investment and more to determine the perfect match. First, consider the type of work the attachment will perform. From primary to secondary demolition and from rebar-enforced concrete to wood and brick, the application should be the first factor to guide an attachment choice. 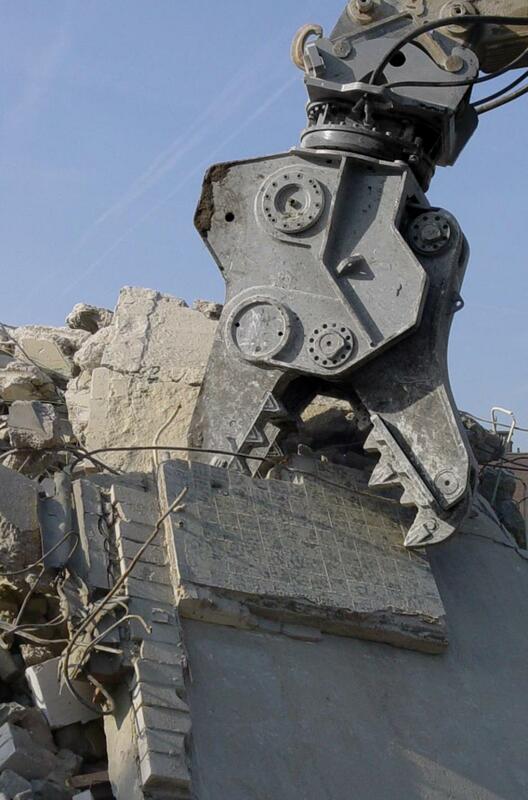 When starting to demolish a structure, multi-quick processors, shears, crushers, pulverizers and demolition grapples tend to be the top picks for primary demolition. The choice between them depends on the type of material and how it needs to be broken up. Crusher and pulverizer attachments, for example, best tackle jobs made up of mostly concrete. Choose a crusher — or "cracker" — if the structure is composed of concrete with little or no rebar and if it's necessary to break the concrete into chunks large enough for easy sorting and recycling. A pulverizer attachment better handles concrete that's heavily reinforced with rebar. Unlike the crusher attachment, the pulverizer will break the concrete into small pieces and cut through the embedded rebar, allowing the concrete to fall to the ground rather than hang onto the rebar. Pulverizers also can break concrete into manageable sizes during secondary demolition. If the demolition involves both crushing concrete and cutting steel, contractors should consider combi-crushers that incorporate both cutting edges and teeth. If concrete isn't part of the demolition picture but steel is, a demolition processor with shear jaws or a mobile shear attachment will work best since they cut through steel better than a tool meant for multiple types of material. 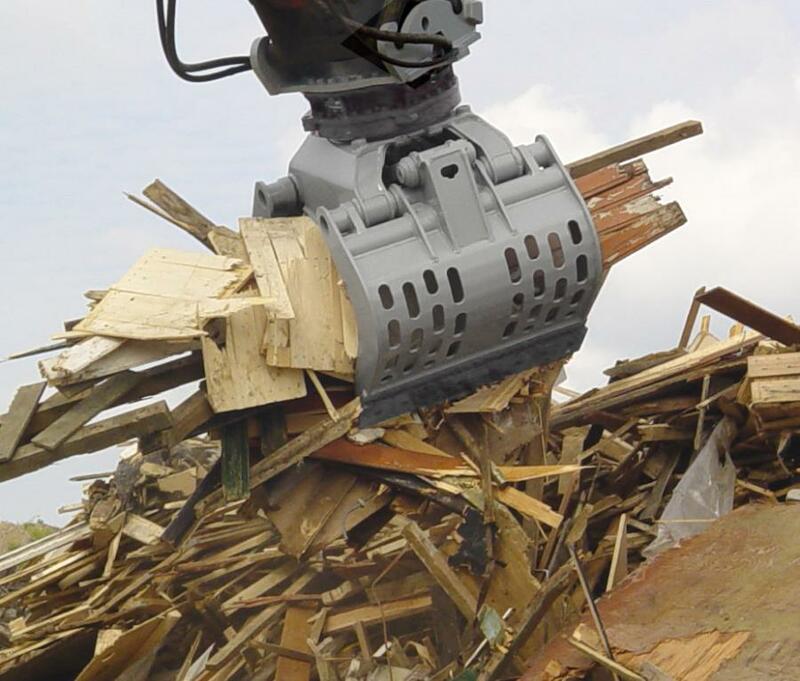 When working jobs with light materials — such as wood and brick, commonly found in residential demolition — use a demolition grapple. 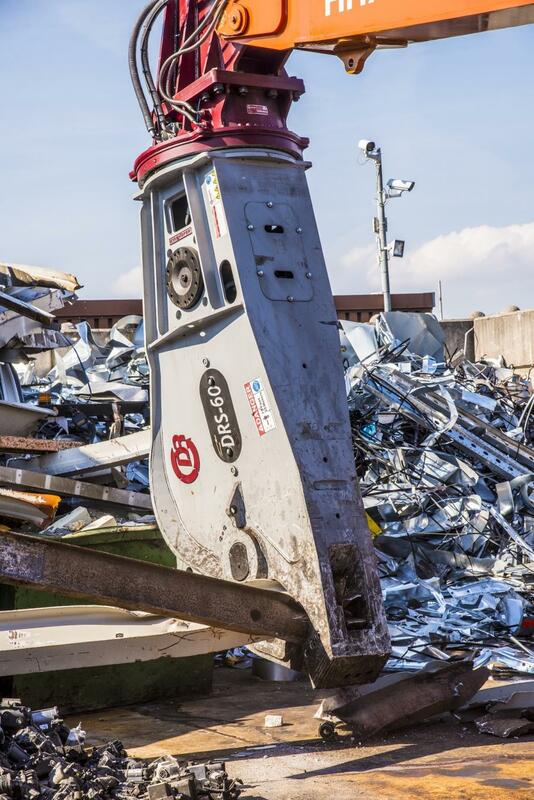 Besides breaking apart materials, rotatinggrapples work well for sorting during secondary demolition, and increase versatility and productivity by allowing a wide range of movement. For versatility across different demolition jobs, a multi-quick processor often fits best. The attachment's interchangeable jaws handle numerous materials. The jaw types include crushers, pulverizers, a combination of both, and steel-cutting jaws. Some manufacturers offer additional specialty options, such as jaws for cutting through timber in the forest industry; jaws for cutting steel tanks, pipes and vessels; and highly powerful jaws for heavily reinforced concrete. While multi-quick processors may cost more than other attachments, approximately 15 to 20 percent more than crushers for example, they more than make up for that difference in their versatility achievable through the interchangeable jaw sets. After determining the best type of attachment for the job, consider the technology powering the tool. 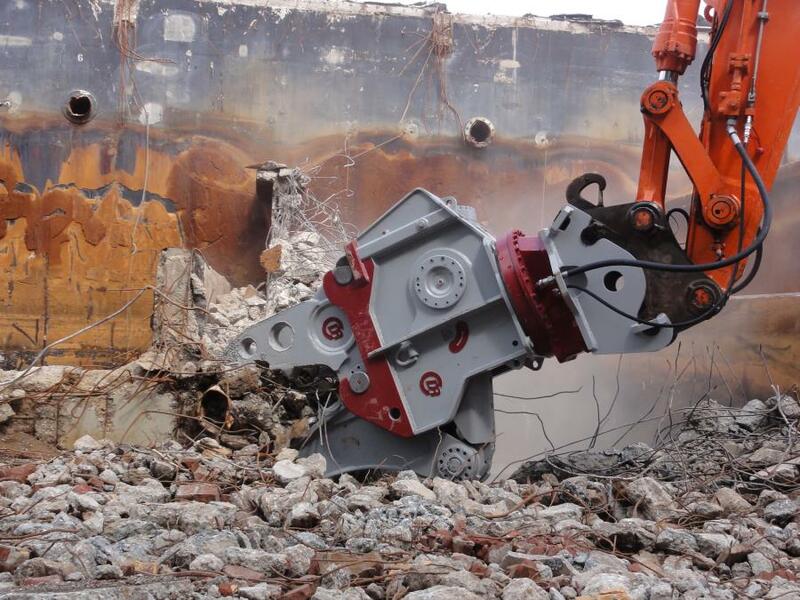 Cylinders power demolition attachments, and typically the larger the cylinder, the more powerful the tool. Because of this, contractors seeking more demolition power in the past had to buy or rent a larger excavator to handle the larger attachment. That's no longer the case. As manufacturers incorporate more technology into attachments, some are achieving as much as 25 percent more power without increasing the cylinder size. To pull this off, manufacturers build additional chambers into the cylinder to allow for as much as 20 percent more surface area. Often, this results in an attachment with the same power as a tool two sizes larger. For example, for a crusher it means that a section of concrete that may take a competitive attachment five or six "bites" to break through only takes the tool with the enhanced cylinder technology one or two. This technology gives contractors access to higher crushing and cutting forces they previously couldn't have had without the huge expenses of a larger tool as well as a bigger carrier to operate that tool. Larger carriers also come with higher operating costs. The high power-to-weight ratio — higher on attachments with this technology than any other tool in its size class — also opens the door to more efficient high-reach demolition. This is both because contractors can use smaller carriers and because the attachment's light weight and superior cylinder technology improve tool performance and fuel efficiency. Some attachments with innovative cylinder technology reduce carrier fuel consumption by up to 20 percent compared to other models. In some cases, the attachment's efficient design allows it to function normally when the carrier is set in economy mode, achieving the same performance as competitive attachments on an excavator running at full throttle. In addition, this advanced cylinder technology allows manufacturers to design high-performing attachments. When combined with double-acting speed valves, the advanced attachment designs not only offer improved power and efficiency but also improved productivity. Together, the enhanced cylinder design and double-acting speed valves deliver faster cycle times — from 3.8 seconds to 5 seconds on bigger tools — and as much as 20 percent more power than conventional cylinders. Of course, the best attachment in the world still needs a suitable carrier to perform well. Make sure to match the attachment to the carrier size and weight. Heavier attachments, naturally, require larger, heavier carriers which cost more to operate. Too heavy an attachment can cause excessive wear to the excavator and will affect performance. In addition, tools that are too heavy for a machine are a safety risk for other workers near the carrier while an attachment that is too small reduces productivity. Also ensure the carrier has enough hydraulic capacity to feed the attachment. Inadequate flow or hydraulic pressure will slow the tool's cycle times, reducing productivity. Too little pressure also results in less closing force or torque, depending on the attachment. Another item to check is the attachment's hydraulic circuit requirements. Is the excavator equipped with enough auxiliary hydraulic circuits for the attachment? For example, rotation shears and multi-quick processors require two double-acting hydraulic circuits, one circuit for opening and closing the jaw and one for 360-degree rotation. Attachments that don't rotate, such as static pulverizers or shears, only require one double-acting circuit. When determining the attachment best suited for the application and power rating, look for a product that is durable and easy to service. Some attachments may seem great up front, but end up being a nightmare of downtime and repair costs. One method for choosing a low-maintenance attachment is to find a tool with no or very few protruding parts, such as hydraulic hoses. These can be easily damaged during operation, particularly in harsh demolition environments. Look for attachments with these components enclosed within the tool yet are easy to access through service openings. Also keep wear parts in mind. Shear and crushing attachments' cutting edges and teeth need to be replaced when worn. Exchangeable cutting edges are an industry standard, but it's still smart to ensure they are available. When considering multi-quick processors, pay attention to how quickly jaws can be switched out. Some manufacturers build multi-quick processors with jaws that operators can change within minutes on site, compared to the hours needed to bring many other attachments back to the shop to exchange. Workers only need to manually remove one pin from quick-exchange models during change-outs, compared to three from many other manufacturers' processors. The rest of the jaw exchange process is done hydraulically from the safety of the cab. This system not only removes the hassle of pounding out two or three pins, but virtually eliminates the danger of the jaw falling and injuring a worker after the last pin is removed. Just like with beer, the best tool depends on the situation. Seasoned buyers and industry newbies can all benefit from taking a careful look at their options and requirements while searching for a new attachment. Also, it's always a good idea to ask the dealer and manufacturer questions. Choosing the most effective pairing of tool and carrier goes beyond application and power. Carefully consider every aspect of the attachment and carrier to form a pair that will boost productivity, ROI and, potentially, open up opportunities to work in new applications. The right choice will mean the perfect match. For more information, call 800/268-9525 or visit www.kinshofer.com.